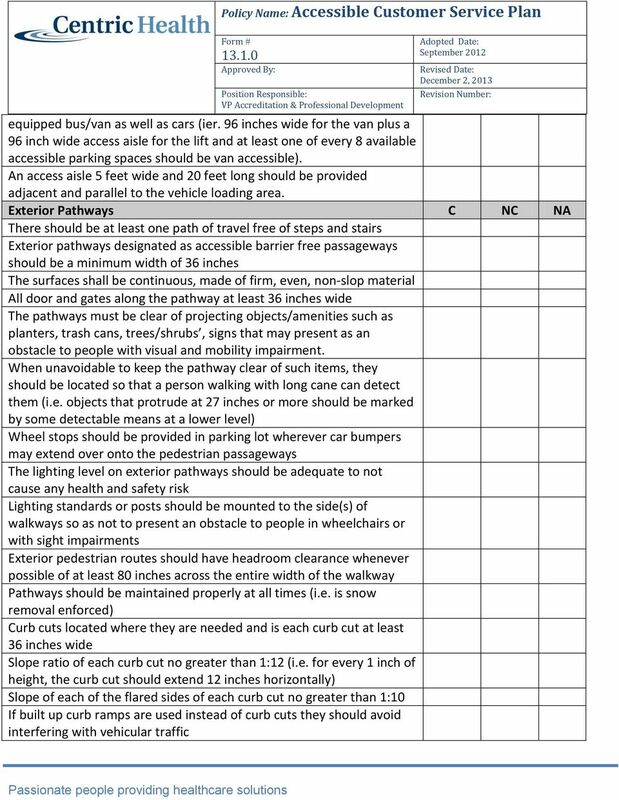 Download "Policy Name: Accessible Customer Service Plan. Form # 13.1.0. Position Responsible: VP Accreditation & Professional Development"
1 Policy Name: Accessible Customer Service Plan Policy Statement This policy is intended to meet the requirements of the Accessibility Standards for Customer Service, Ontario Regulation 429/07 under the Accessibility for Ontarians with Disabilities Act, 2005 (AODA), and applies to the provision of goods and services to the public or other third parties, not to the goods themselves. Centric is committed to applying the principles and guidelines of the AODA and strives to provide goods and services in a way that respects the dignity and independence of persons with disabilities. Centric will use reasonable efforts to ensure its policies, practices and procedures are consistent with the spirit and requirements of the Customer Service Standard. It is the policy of Centric that every employee and customer has a right to equitable treatment with respect to employment, services, goods, facilities and accommodation without discrimination in accordance with the provisions of the Ontario Human Rights Code. Centric strives to provide a barrier-free environment for its customers. Goods and services will be provided in a manner that is based up on the principles of dignity, independence, integration and equal opportunity to all of its customers. The provision of goods and services to customers with disabilities will be integrated wherever possible. We will endeavor to ensure that customers with disabilities receive the same high standard of service that we strive to provide to all customers. Purpose The Accessibility for Ontarians with Disabilities Act, 2005 (AODA) is a Provincial act aimed at creating a more accessible Ontario by identifying. And to the extent possible, preventing and eliminating barriers experienced by persons with disabilities. A standard for customer service (the Customer Service Standard) has been established under the AODA to ensure that goods and services are, where at all possible equally accessible to every Ontarian. This policy deals with the Accessibility Standards for Customer Service in Ontario. 3 Policy Name: Accessible Customer Service Plan A person with a disability who is accompanied by a support person will be allowed to have that person accompany them on our premises. Fees will not be charged for support person. We will notify customers of this through a notice posted on our premises and posting it on Centric s Website, if any, or by such other method as is reasonable in the circumstances. Notice of Temporary Disruption In the event of a planned or unexpected disruption to services or facilities for customers with disabilities Centric will notify customers promptly. This clearly posted notice will include information about the reason for the disruption, its anticipated length of time and a description of alternative facilities or services, if available. The notice will be placed at a conspicuous place on premises owned or operated by Centric, by posting it on Centric s website, if any, or by such other method as is reasonable in the circumstances. Training Centric will provide training to all employees, volunteers and others who deal with the public or other third parties on their behalf. This training will be provided to staff as part of their Orientation to Centric (3 to 6 month period dependent on position). Training will include: An overview of the Accessibility for Ontarians with Disabilities Act, 2005 and the requirements of the customer service standard s plan. Centric s requirements related to the customer service standard. How to interact and communicate with people with various types of disabilities. How to interact with people with disabilities who use an assistive device or require the assistance of a service animal or a support person. How to use the assistive devices (TTY, wheelchair lifts, etc. ), available on-site or otherwise that may help with providing goods or services to people with disabilities. 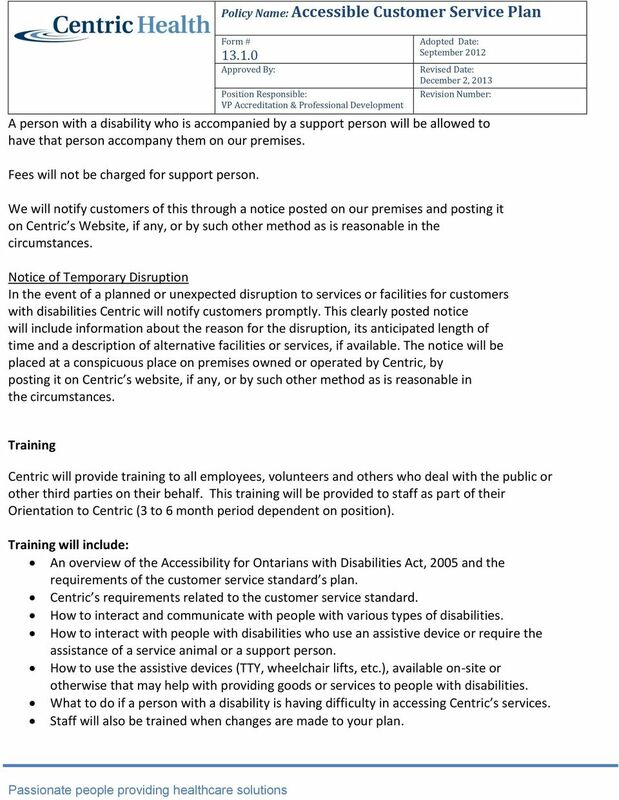 What to do if a person with a disability is having difficulty in accessing Centric s services. Staff will also be trained when changes are made to your plan. 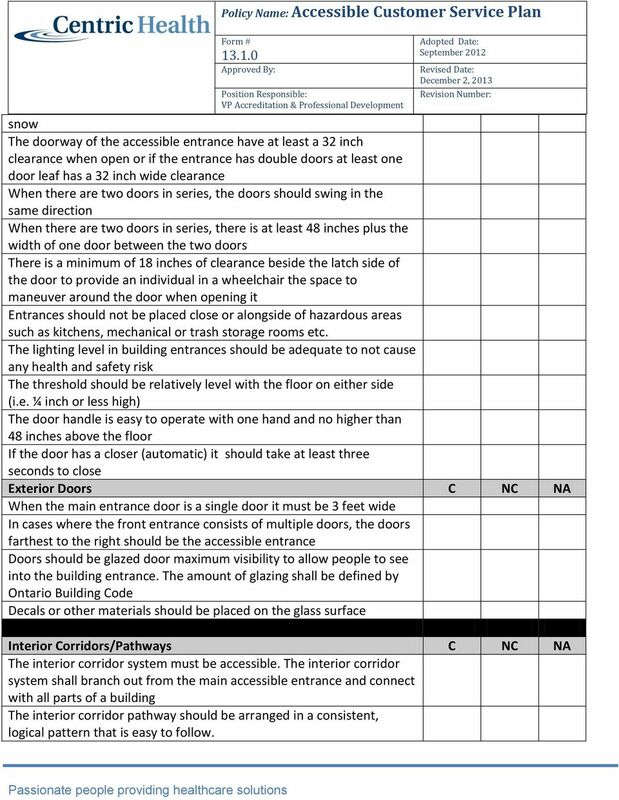 8 Policy Name: Accessible Customer Service Plan snow The doorway of the accessible entrance have at least a 32 inch clearance when open or if the entrance has double doors at least one door leaf has a 32 inch wide clearance When there are two doors in series, the doors should swing in the same direction When there are two doors in series, there is at least 48 inches plus the width of one door between the two doors There is a minimum of 18 inches of clearance beside the latch side of the door to provide an individual in a wheelchair the space to maneuver around the door when opening it Entrances should not be placed close or alongside of hazardous areas such as kitchens, mechanical or trash storage rooms etc. 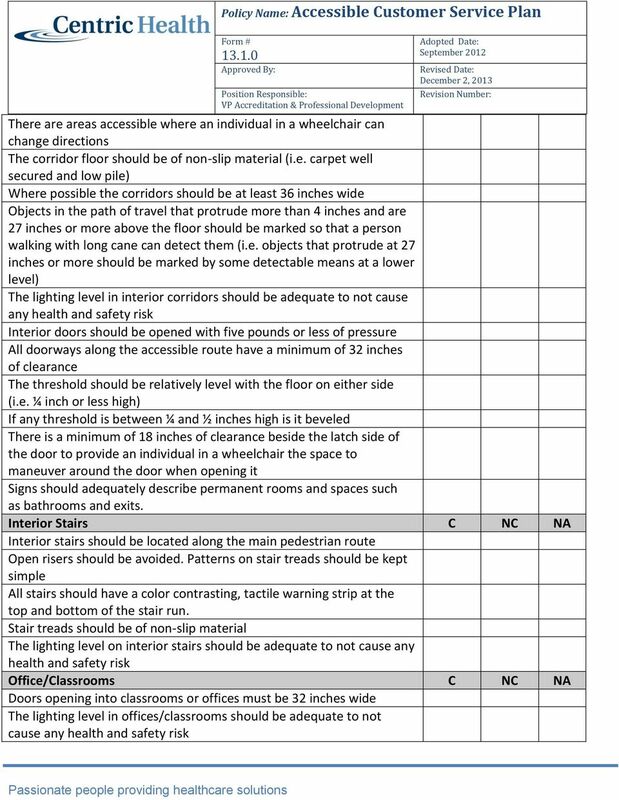 The lighting level in building entrances should be adequate to not cause any health and safety risk The threshold should be relatively level with the floor on either side (i.e. ¼ inch or less high) The door handle is easy to operate with one hand and no higher than 48 inches above the floor If the door has a closer (automatic) it should take at least three seconds to close Exterior Doors C NC NA When the main entrance door is a single door it must be 3 feet wide In cases where the front entrance consists of multiple doors, the doors farthest to the right should be the accessible entrance Doors should be glazed door maximum visibility to allow people to see into the building entrance. 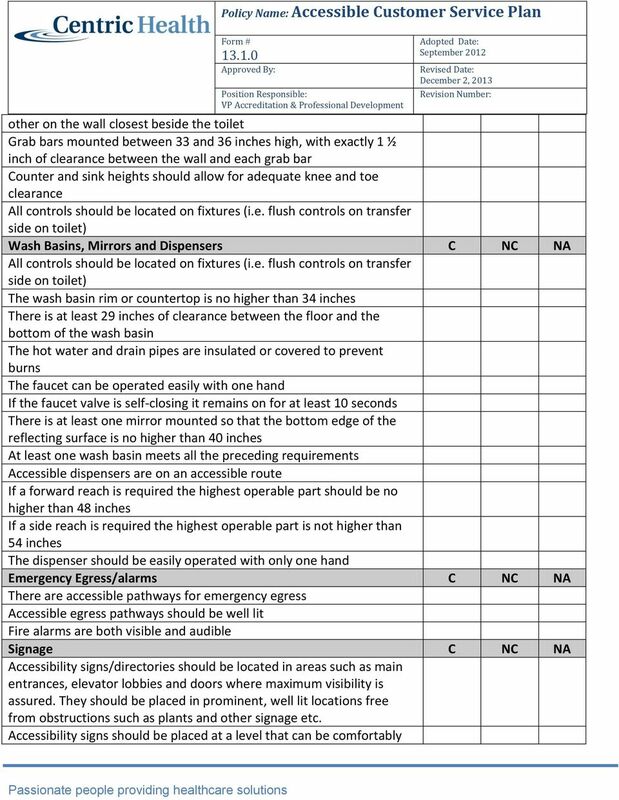 The amount of glazing shall be defined by Ontario Building Code Decals or other materials should be placed on the glass surface Interior Corridors/Pathways C NC NA The interior corridor system must be accessible. The interior corridor system shall branch out from the main accessible entrance and connect with all parts of a building The interior corridor pathway should be arranged in a consistent, logical pattern that is easy to follow. 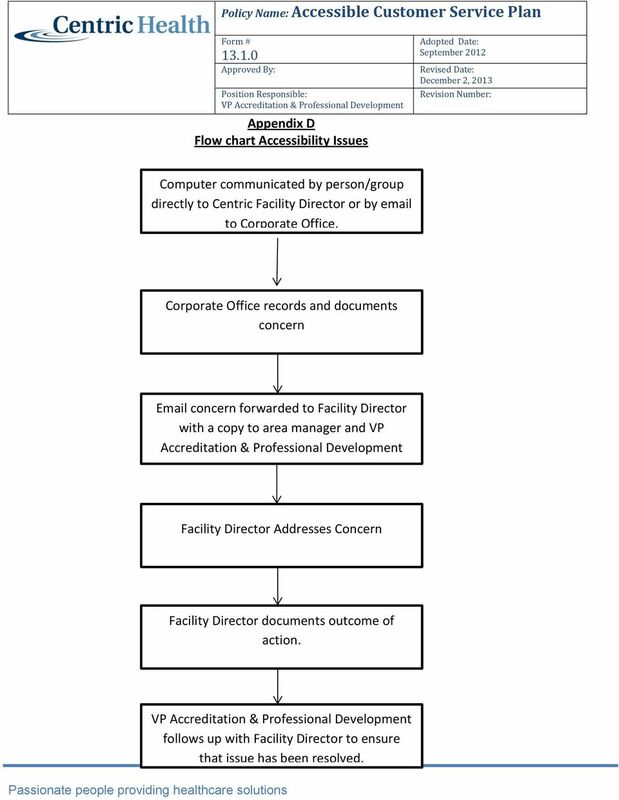 15 Policy Name: Accessible Customer Service Plan Appendix D Flow chart Accessibility Issues Computer communicated by person/group directly to Centric Facility Director or by to Corporate Office. 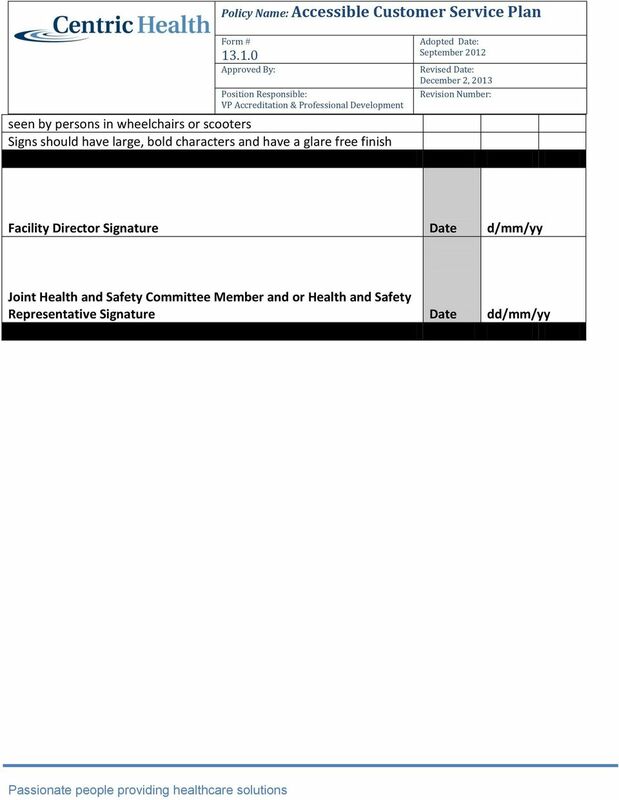 Corporate Office records and documents concern concern forwarded to Facility Director with a copy to area manager and VP Accreditation & Professional Development Facility Director Addresses Concern Facility Director documents outcome of action. follows up with Facility Director to ensure that issue has been resolved. 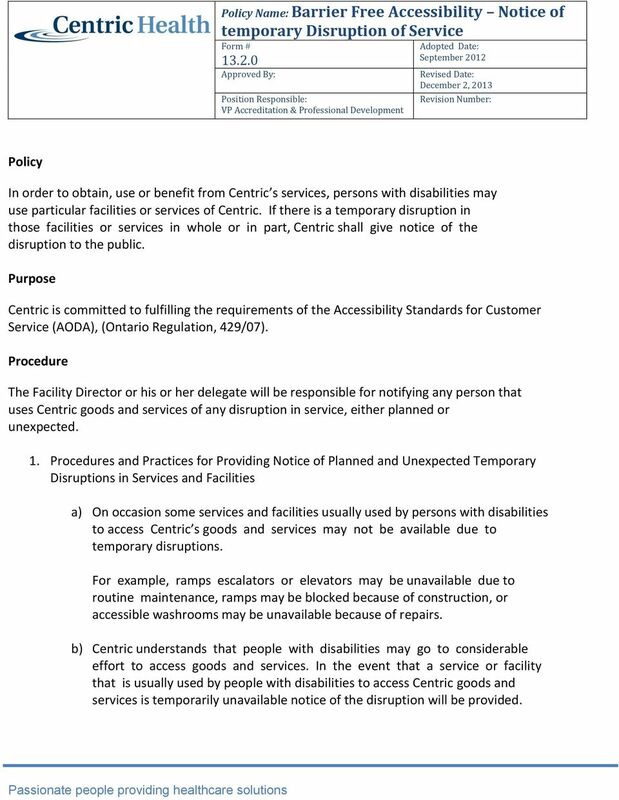 16 Policy Name: Barrier Free Accessibility Notice of temporary Disruption of Service Policy In order to obtain, use or benefit from Centric s services, persons with disabilities may use particular facilities or services of Centric. If there is a temporary disruption in those facilities or services in whole or in part, Centric shall give notice of the disruption to the public. 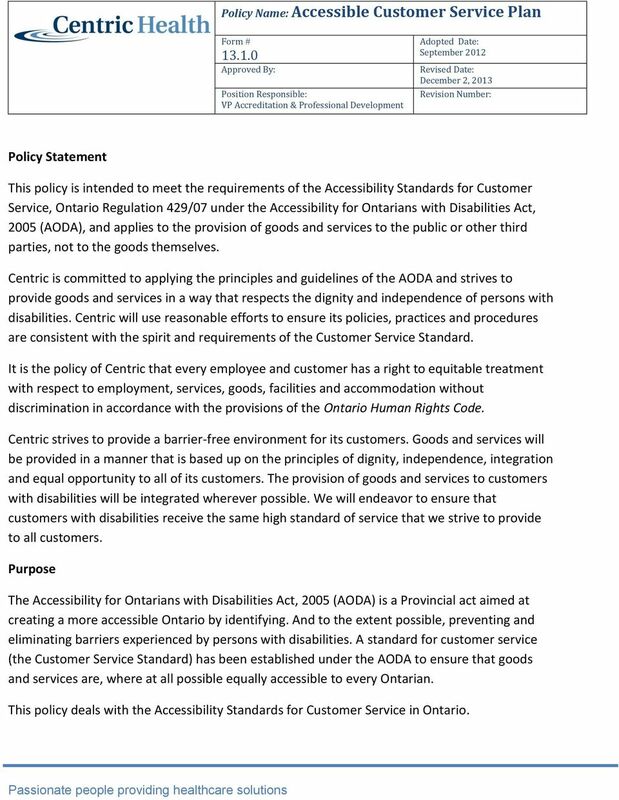 Purpose Centric is committed to fulfilling the requirements of the Accessibility Standards for Customer Service (AODA), (Ontario Regulation, 429/07). Procedure The Facility Director or his or her delegate will be responsible for notifying any person that uses Centric goods and services of any disruption in service, either planned or unexpected. 1. 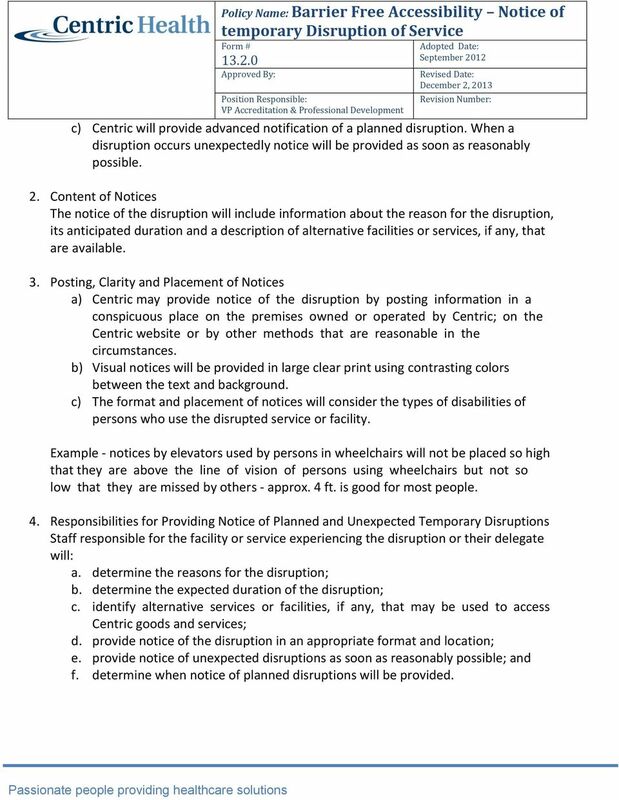 Procedures and Practices for Providing Notice of Planned and Unexpected Temporary Disruptions in Services and Facilities a) On occasion some services and facilities usually used by persons with disabilities to access Centric s goods and services may not be available due to temporary disruptions. For example, ramps escalators or elevators may be unavailable due to routine maintenance, ramps may be blocked because of construction, or accessible washrooms may be unavailable because of repairs. b) Centric understands that people with disabilities may go to considerable effort to access goods and services. In the event that a service or facility that is usually used by people with disabilities to access Centric goods and services is temporarily unavailable notice of the disruption will be provided. 17 Policy Name: Barrier Free Accessibility Notice of temporary Disruption of Service c) Centric will provide advanced notification of a planned disruption. When a disruption occurs unexpectedly notice will be provided as soon as reasonably possible. 2. Content of Notices The notice of the disruption will include information about the reason for the disruption, its anticipated duration and a description of alternative facilities or services, if any, that are available. 3. Posting, Clarity and Placement of Notices a) Centric may provide notice of the disruption by posting information in a conspicuous place on the premises owned or operated by Centric; on the Centric website or by other methods that are reasonable in the circumstances. b) Visual notices will be provided in large clear print using contrasting colors between the text and background. c) The format and placement of notices will consider the types of disabilities of persons who use the disrupted service or facility. Example - notices by elevators used by persons in wheelchairs will not be placed so high that they are above the line of vision of persons using wheelchairs but not so low that they are missed by others - approx. 4 ft. is good for most people. 4. Responsibilities for Providing Notice of Planned and Unexpected Temporary Disruptions Staff responsible for the facility or service experiencing the disruption or their delegate will: a. determine the reasons for the disruption; b. determine the expected duration of the disruption; c. identify alternative services or facilities, if any, that may be used to access Centric goods and services; d. provide notice of the disruption in an appropriate format and location; e. provide notice of unexpected disruptions as soon as reasonably possible; and f. determine when notice of planned disruptions will be provided. 18 Policy Name: Barrier Free Accessibility Notice of temporary Disruption of Service Agents and Others Providing Services on behalf of Centric Agents and others providing services on behalf of Centric will abide by these procedures and practices. 6. Review of these Procedures and Practices These procedures and practices will be reviewed annually and in accordance with legislation. 7. Modifications to these Procedures and Practices References No changes will be made to these procedures and practices before considering the affect on persons with disabilities and on consistency with legislation. 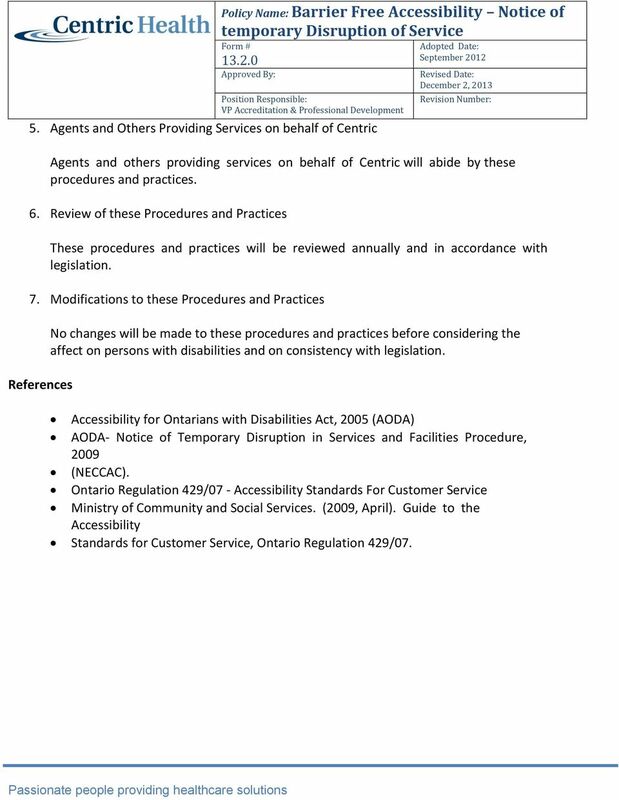 Accessibility for Ontarians with Disabilities Act, 2005 (AODA) AODA- Notice of Temporary Disruption in Services and Facilities Procedure, 2009 (NECCAC). Ontario Regulation 429/07 - Accessibility Standards For Customer Service Ministry of Community and Social Services. (2009, April). Guide to the Accessibility Standards for Customer Service, Ontario Regulation 429/07. 20 Policy Name: Barrier Free Accessibility Provision of Goods and Services Including Assistive Devices b. Where staff is aware of a person's need for assistance in accessing goods and services, staff will inform persons with disabilities of the accommodations and/or the assistive devices the Centric Health makes available to persons with disabilities. 2. Accommodation Accommodation often involves simple or informal forms of assistance that staff can provide quickly and easily. For example, staff may offer to fill out a form for a person who finds it difficult to grip a pen. In some instances, more formal accommodation may be requested. Formal accommodation, such as a sign language interpreter, may require pre-planning. Some requests for accommodation will be uncertain and require assessment to determine the best accommodation to allow the client or customer to access services. Such accommodation may require pre-planning by staff and management and/or the approval of expenses. 3. Management Responsibilities Managers or their delegates will: a. either approve, deny, research and/or approve the accommodation request b. ensure the accommodation has been arranged for the client c. make certain the customer is kept informed of the status of their request in a timely manner. 4. 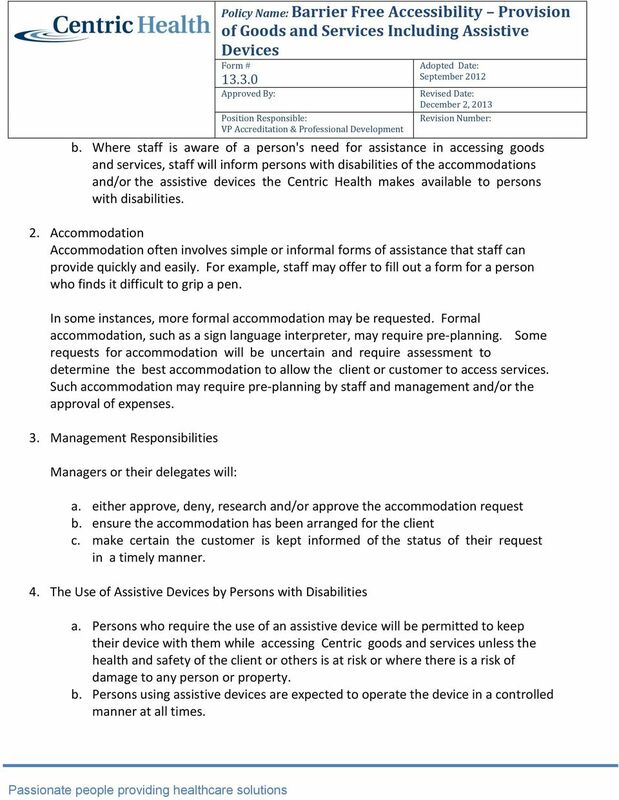 The Use of Assistive Devices by Persons with Disabilities a. Persons who require the use of an assistive device will be permitted to keep their device with them while accessing Centric goods and services unless the health and safety of the client or others is at risk or where there is a risk of damage to any person or property. b. Persons using assistive devices are expected to operate the device in a controlled manner at all times. 21 Policy Name: Barrier Free Accessibility Provision of Goods and Services Including Assistive Devices c. If the device cannot stay with the person or if the person is not permitted to use the device, Centric will make certain that other means of accommodation are available to the customer. 5. Disagreements about the use of Assistive Devices and Accommodation Decisions a. 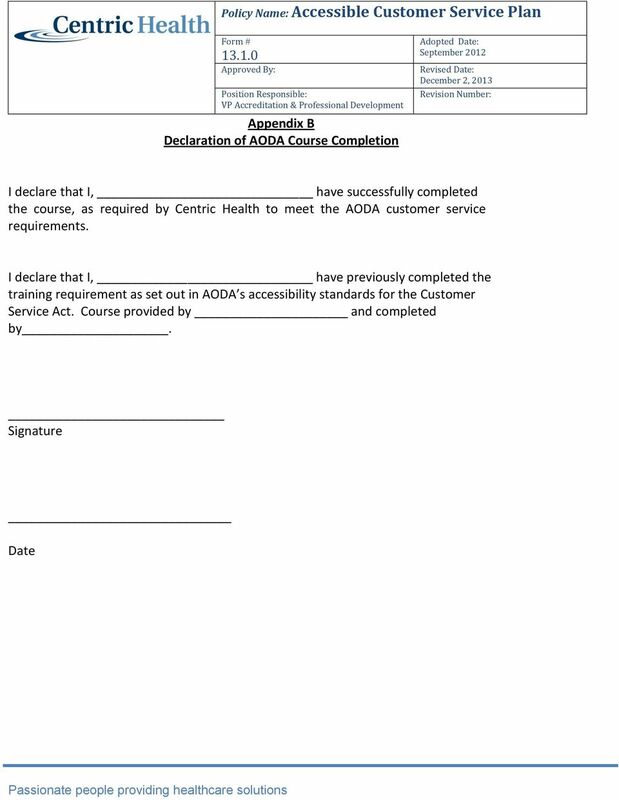 In the event that staff and clients or customers disagree about the use of assistive devices or accommodation decisions, staff will follow the procedure set out in Customer Complaint Process for Addressing Accessibility Issues. 6. Storing and Releasing Accommodation Records a. Accommodation records containing information about a particular client or other customer will be subject to the confidentiality restrictions of the Personal Health Information Protection Act (PHIPA). 7. Service Providers and Others Providing Services on behalf of Centric a. Service Providers and Others Providing Services on behalf of Centric will adhere to these procedures and practices. b. 8. Review of these Procedures and Practices a. These procedures and practices will be reviewed annually and in accordance with legislation. 9. Modification of these Procedures and Practices a. No changes will be made to these procedures and practices before considering the effect on persons with disabilities and on consistency with legislation. References Accessibility for Ontarians with Disabilities Act, 2005 (AODA) AODA- Provision of Goods and Services Including the Use of Assistive Devices Procedure, 2009 (NECCAC) Ontario Regulation 429/07 - Accessibility Standards For Customer Service Ministry of Community and Social Services. (2009, April). 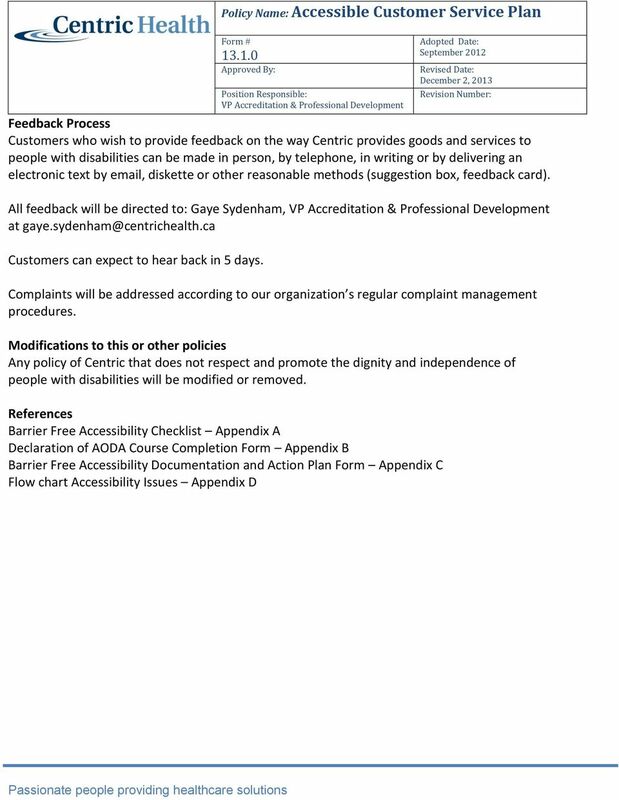 Guide to the Accessibility Standards for Customer Service, Ontario Regulation 429/07. 23 Policy Name: Barrier Free Accessibility Service Animal Practices Centric premises with the animal and keep the animal with them in areas where the public or other third parties are allowed, unless the animal is excluded by law. If the animal is excluded by law, Centric will provide another means of accommodating the person. 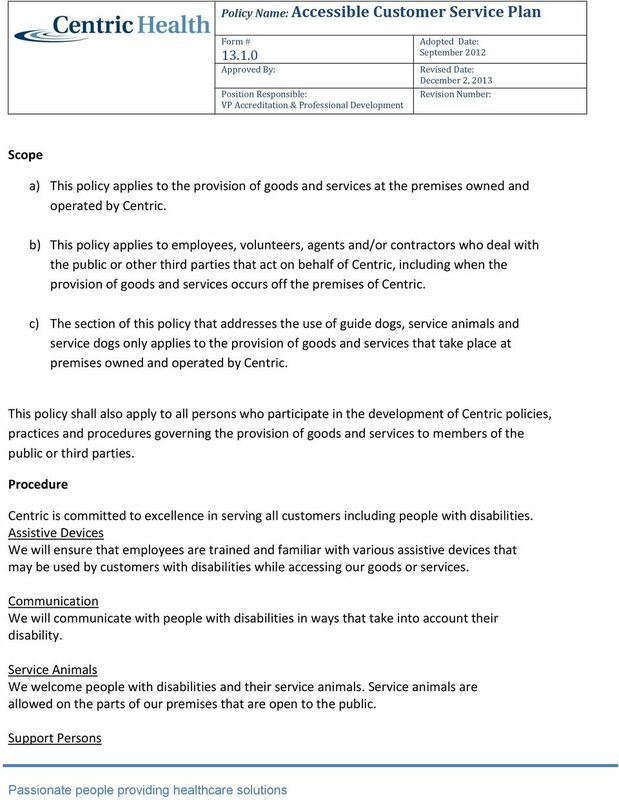 For example, if the animal is not permitted into a certain area by law, Centric may suggest providing services in an area where the service animal is permitted. 3. Responsibilities of Persons with Service Animals It is the responsibility of the person with the disability to ensure that: a. their service animal is kept in control at all times and is well behaved; b. the service animal is not a threat to health and safety; and c. the service animal's immunizations are up-to-date. 4. Removal of Service Animals from the Centric Premises Centric is aware that service animals are usually well trained and well behaved. In the event that this is not the case, service animals may be removed for any one of the following reasons: disruptive or aggressive behavior, such as growling, barking or other signs of threatening or aggressive behavior; causing damage, including causing damage to any person or property; poor health, such as a contagious illness where the animal risks spreading the illness to others. 5. Areas Off Limits to Service Animals Service animals may be prohibited from entering certain areas for health and safety reasons or due to law. For example, Ontario Regulation 562 under the Health Protection and Promotion Act states that animals are not permitted in areas where food is prepared, handled, served, displayed, stored, sold, or offered for sale. It must be noted that service dogs are exempt from this restriction and are permitted to go where food is served, sold or offered for sale, such as restaurants including buffets. However all animals, including service dogs, are not permitted to enter areas where food is prepared, such as kitchens. 25 Policy Name: Barrier Free Accessibility Service Animal Practices Ministry of Community and Social Services. (2009, April). Guide to the Accessibility Standards for Customer Service, Ontario Regulation 429/07. 26 Policy Name: Barrier Free Accessibility Support Persons to Person with Disabilities Policy Centric recognizes the importance of support persons to persons with disabilities and welcomes them where Centric provides goods and services on property it owns or operates if the public or other third parties have access to these areas. Purpose Centric is committed to fulfilling the requirements of the Accessibility Standards for Customer Service (AODA), (Ontario Regulation, 429/07). Procedure Use of Support Persons a. Support persons may be a family member, friend or a trained professional. They provide a wide range of assistance to persons with disabilities including but not limited to assistance with communication, personal care and assistance accessing goods and services. b. If a person with a disability is accompanied by a support person, Centric shall ensure that both persons are permitted to enter the premises together and that the person with a disability is not prevented from having access to their support person while on the premises. c. Centric may require a person with a disability to be accompanied by a support person where Centric provides its goods and services on property that it owns and operates. Centric may require this if it is deemed necessary to protect the health and safety of the person with the disability or the health and safety of others on the premises. This would occur after consultation with the person with the disability. d. Centric will refer to its procedures for determining a person's need for a support person for health and safety reasons. 28 Policy Name: Barrier Free Accessibility Support Persons to Person with Disabilities Ministry of Community and Social Services. (2009, April). 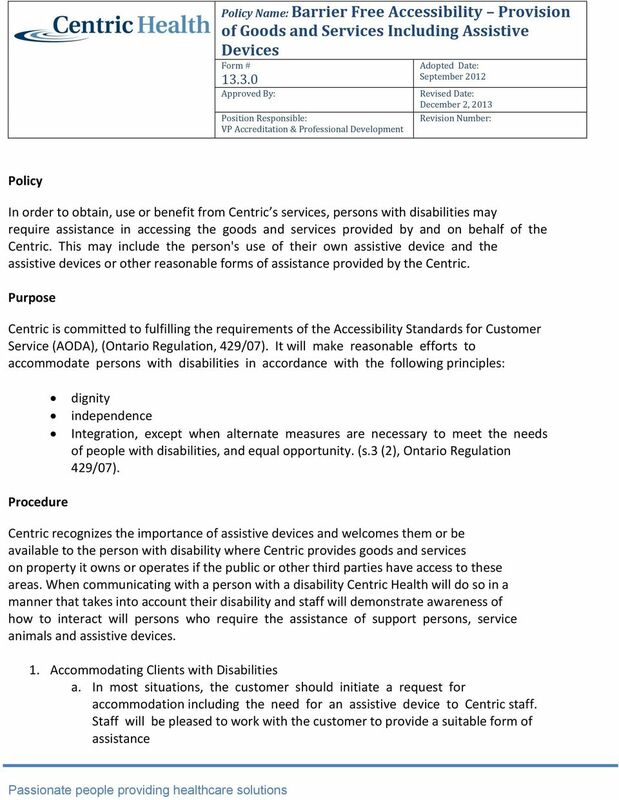 Guide to the Accessibility Standards for Customer Service, Ontario Regulation 429/07. 31 Policy Name: Barrier Free Accessibility Customer Service identification of current barriers, development of a new 12 month plan with timelines, and a definition of accountabilities. 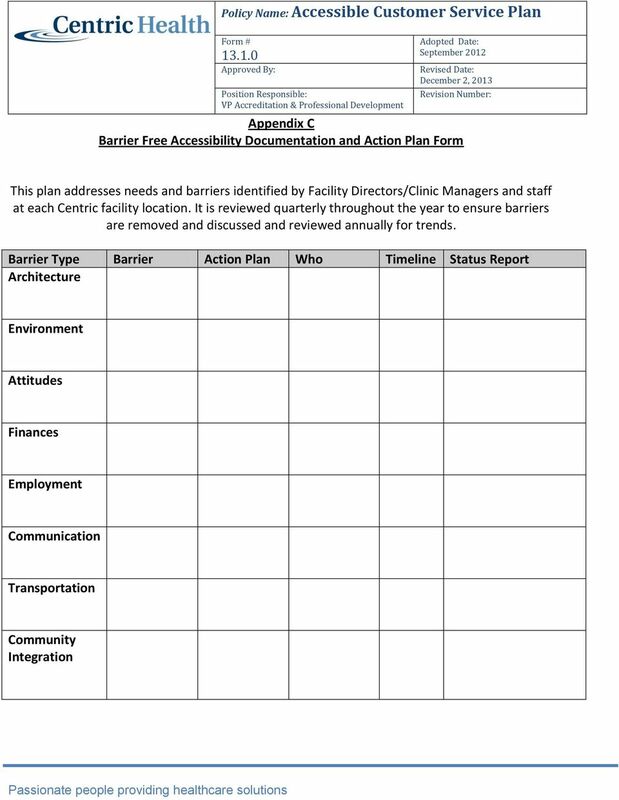 Accessibility Standards Architectural Standards Architectural barriers are physical features that limit or prevent people with disabilities from obtaining services, limit staff or consultants from working in the environment and/or limit any other visitors with disabilities from entering a Centric facility. The following goals have been established to guide Centric in the architectural design of its facilities, and ensure that clients, staff and other interested parties have ready access to, and use of, buildings and space used for the delivery of our rehabilitation programs and services: Easy access to and from transportation drop off and pick up areas. Accessible street entrance curb, stairs/ramp, rail, automated entry doors of appropriate width. When one entrance is not accessible and another entrance is accessible, a sign must provide direction to the accessible entrance. The alternative entrance must be open during business hours. When a ramp is added to provide an accessible entrance, the slope of the ramp should be as shallow as possible but not more than 1:12. Easy access regarding movement within the building elevator in situations where the Centre does not have ground floor access. Appropriate transitional flooring materials to ensure easy and safe access between areas in the Centre. Wheelchair accessibility including visibility from a wheelchair with doorways and hallways of appropriate width. Counters and workstations must have a surface height of no more than 34 and no less than 28 above the floor. At least 27 of knee clearance must be provided between the floor and the underside of the counter/workstation. An accessible route must be provided to ensure access to each counter/workstation and a clear floor area of 30 by 48 at each accessible seating location. This clear floor area should extend 19 under the counter/workstation to provide leg and knee clearance. Washroom accessibility on the premise. Appropriate hardware including door handles and faucets. A lever or loop-type handle is recommended because it can be used without grasping, pinching or twisting. 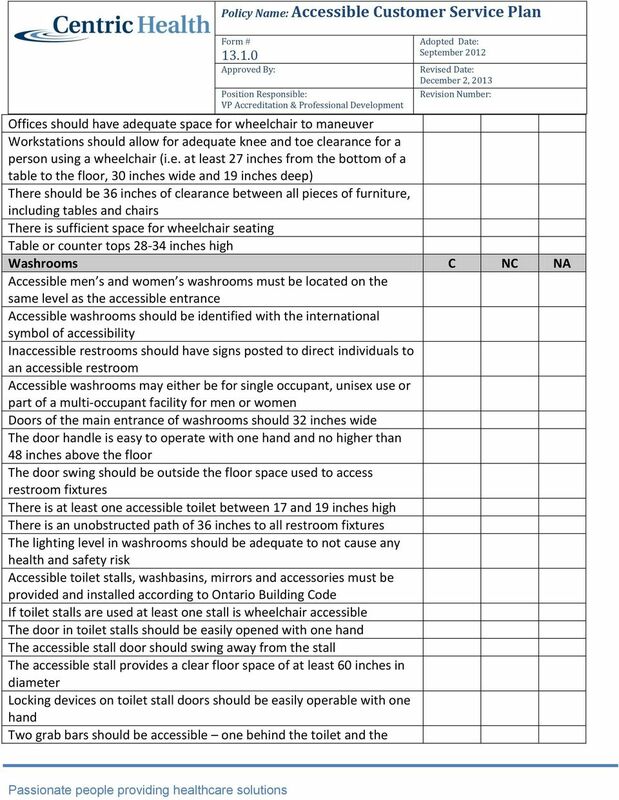 32 Policy Name: Barrier Free Accessibility Customer Service Safe and accessible Centre design including client examination and interview offices, and functional testing and treatment areas. Well marked and unobstructed emergency exits accessible to ground and designated evacuation areas. Notice of Temporary Disruptions in Services and Facilities In order to obtain, use or benefit from Centric Health s services, persons with disabilities may use particular facilities or services of Centric Health. If there is a temporary disruption in those facilities or services in whole or in part, Centric Health shall give notice of the disruption to the public. The notice of the disruption will include information about the reason for the disruption, its anticipated duration and a description of alternative facilities or services, if any, that are available. Notice may be given by posting the information at a conspicuous place on premises owned or operated by Centric, by posting it on Centric s website, if any, or by such other method as is reasonable in the circumstances. Parking Standards Centric must have dedicated accessible parking space available for clients, staff and/or other stakeholders. The accessible parking must have space for the vehicle and an additional space located either to the right or to the left of the space that serves as an access aisle. This aisle is needed to permit a person using a wheelchair, electric scooter, or other mobility device to get out of their car or van. A sign with the international symbol of accessibility must be located in front of the parking space and mounted high enough so it is not hidden by a vehicle parked in the space. Accessible parking spaces should be the spaces closest to the accessible entrance and be located on level ground. 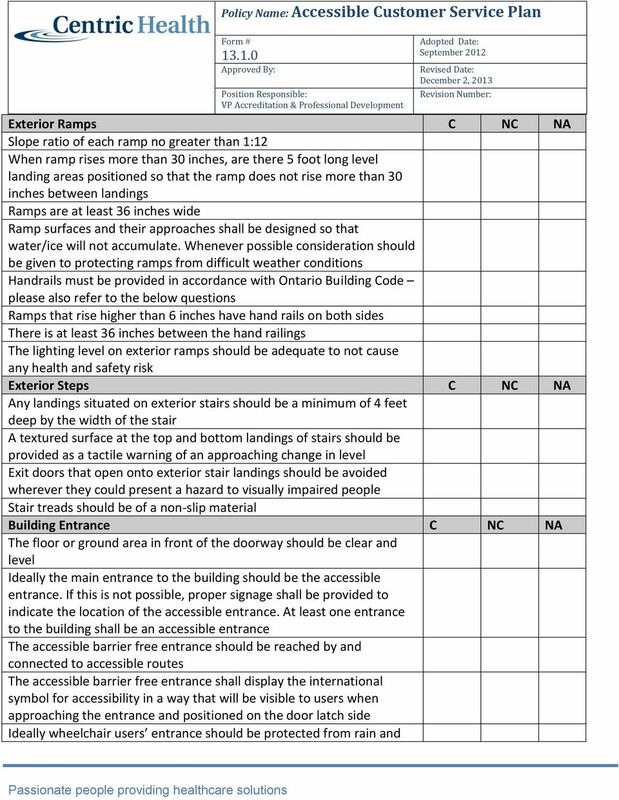 If it is not readily achievable to locate accessible parking in the closest spaces due to sloped pavement or other existing conditions, then the closest level area should be selected. An accessible route must be provided between the access aisle and the accessible building entrance. This route must have no steps or steeply sloped surfaces and it must have a firm, stable, slip-resistant surface. 33 Policy Name: Barrier Free Accessibility Customer Service Environmental Standards An environment that has an uplifting design expression contributes to healing and motivates patient recovery. The following goals guide Centric in creating a physical rehabilitation environment that is barrier free and promotes client outcomes and staff well-being: Ambience Air Quality Noise or sound Visibility - overhead and adequate natural lighting Way finding cuing Communication - auditory cuing intercom Safety ability of staff to supervise at appropriate level Privacy / confidentiality of information / distractions Ergonomic design of furniture Public Transportation Standards The following public transportation standards guide for Centric is used in the selection of facility locations: To ensure that the location of the Centre is visibly marked with signs (i.e., company signage is located on the face of the building, building directory and office door) To ensure that Centres are within a reasonable walking distance from public transportation on a direct service line that has service within every hour during normal business hours. 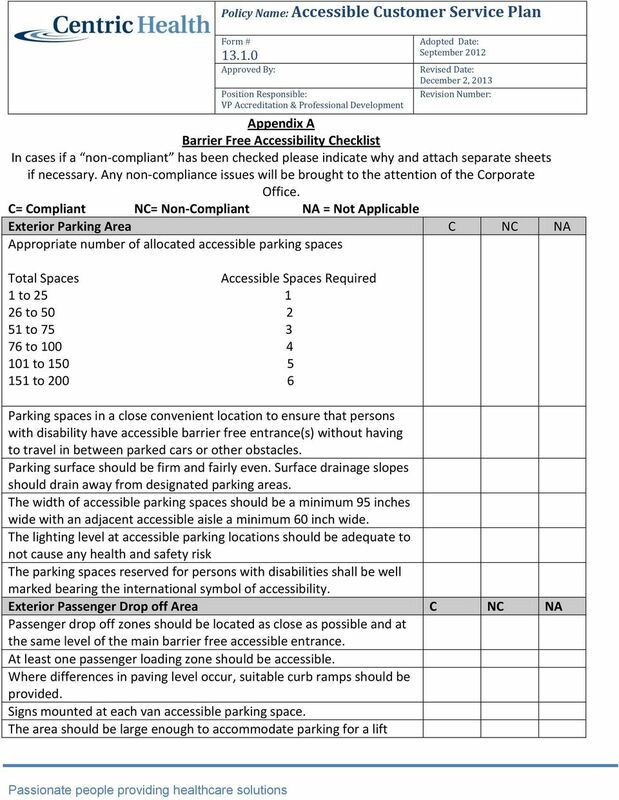 Where possible, to provide the appropriate amount of cost free parking spaces for patients who drive to appointments or to ensure that there is free visitor parking nearby To provide an appropriate number of wheelchair accessible parking spaces based on the past history of the program and preferably spaces that can be reserved for patients meeting criteria.